Mayor of Derry & Strabane Hilary McClintock has wished the organisers and participants of Foyle Pride “all the very best”. Mayor McClintock’s message was presented in the Foyle Pride 2016 programme ahead of the festival. 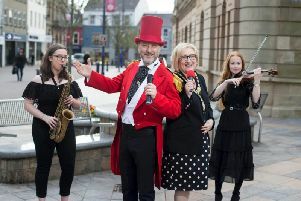 She said: “As Mayor of Derry and Strabane District Council I would like to welcome you all to another Foyle Pride Festival. Award winning gay rights activist and Foyle Pride veteran Sha Gillespie meanwhile has spoken of the evolution of the gay rights movement locally. Writing for the programme, Sha Gillespie said: “I have been involved with Foyle Pride for many years and so proud to be a part of the first pride parade in the city. “I have seen it grow from strength to strength.It is a credit to all those involved that Foyle Pride remains true to the principles of the wider LGBTQ campaign for full equality and civil, social and human rights. Ms Gillespie said that while the battle for marriage equality went on in the north, she was confident of victory “in the near future”.